The United Nations has declared 2005 the International Year of Physics - and there's a very good reason why this particular year was chosen to raise worldwide public awareness of physics. It is also the 100th anniversary of physicist Albert Einstein's miraculous year in which he wrote five - or three depending on whom you ask - of his most famous scientific papers. Also known as the World Year of Physics (WYP) - as declared by the International Union of Pure and Applied Physics - 2005 will feature worldwide events of interest not only to physicists, but also to the general public. Image: The year 2005 marks the 100th anniversary of Albert Einstein's "miracle year" when he published a series of scientific papers that revolutionized our view of space, time and the atom. Two physicists from Washington University in St. Louis who are both known for their ability to speak and write clearly about physics to the layperson will be giving talks throughout 2005 about Einstein's ideas and their impact on science and society 100 years later. They are Clifford M. Will, Ph.D., professor of physics in Arts & Sciences, and John S. Rigden, Ph.D., adjunct professor of physics. Will is known worldwide as one of the leading experts in experimental tests of Einstein's theory of general relativity. His 1986 book "Was Einstein Right?" made The New York Times Christmas Books list that year and won the highly coveted American Institute of Physics Science Writing Award, which is given annually to the best popular science book. A second edition was published in 1993, and at last count, it has been translated in 10 languages. Rigden wrote "Einstein 1905, The Standard of Greatness," which is being released in January by Harvard University Press. "Einstein 1905" explains what Einstein said in each of his famous papers, including the one on his special theory of relavity, the context in which they were presented and the impact they had — and still have — on society. In a review of the new book, Publishers Weekly says: "Rigden writes with a rare felicity, free of jargon and with everyday metaphors that Einstein himself would no doubt have appreciated." Rigden is also author of "Hydrogen: The Essential Element," which Discover magazine named as one of the 20 best science books of 2002. Will has already accepted invitations to more than 25 WYP conferences and outreach activities worldwide, including participating in a 15-event public lecture tour of Canada and presenting lectures in Germany, Italy, France, Spain and Japan. Rigden has accepted 12 invitations to speak on Einstein throughout the United States and will also give talks in France and Sweden. "The World Year of Physics is a celebration of Einstein's 'miracle year' of 1905 when he published a series of papers that revolutionized our view of space, time and the atom," says Will. "In his second miracle year, 1915, his general theory of relativity gave us a dramatic new view of gravity, and of the origin and fate of the universe. "Einstein's insights helped transform everyday life through lasers, semiconductors, nuclear magnetic resonance and other applications of the quantum and the atom, and also helped change how we view the universe and our place in it," adds Will, who is a member of the university's McDonnell Center for the Space Sciences. Today's multi-billion dollar growth industry centered around the Global Positioning System (GPS) wouldn't exist without the proper application of Einstein's special and general relativity theories, says both Will and Rigden. GPS — an array of 24 navigation satellites orbiting the earth, each carrying a precise atomic clock — was originally installed for the U.S. Air Force to guide ships, aircraft, cruise missiles and troops. GPS is now also being used by civilians for precision guidance of aircraft, ships, trucks and cars, as well as in oil exploration, bridge construction, geological studies and animal herd tracking. "The next time you're in a plane approaching an airport in bad weather, you can thank Einstein for the GPS tracker in the cockpit guiding you to a safe landing," adds Will. While some physicists say Einstein produced three of his most famous articles in 1905 — special relativity, quantum theory of light and Brownian motion — Rigden credits him with writing five important papers that year. 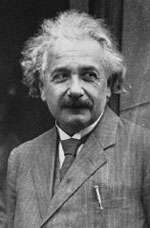 Einstein was 26 at the time and working as a junior clerk in the patent office in Bern, Switzerland. "In this environment, he was cut off from the larger world of physics," writes Rigden in "Einstein 1905." "He had no professional physicists with whom he could share thoughts, collaborate, or argue. No one in his office would alert him to an important new paper in physics. Even his access to libraries was limited." Yet Einstein produced five papers in 1905 that changed science forever, says Rigden, a molecular physicist as well as an historian of science. In the abstract of his new book, Rigden writes: "Einstein is certainly the standard of intelligence and, even more, he is the standard of greatness. The intellectual outpouring that Einstein exhibited in 1905 with five ground-breaking papers in a short six months is unequaled in the history of science. "He challenged 100 years of confirmed wisdom with his March quantum theory of light (the only 1905 paper Einstein regarded as revolutionary); he established molecular dimensions; verified the statistical nature of thermodynamics; reconstructed space and time; and showed that energy and mass were the same thing (E = mc2)." "All this he did by means of pure reason," Rigden continues, "and by so doing, Einstein touched the minds and emotions of Homo sapiens in a very special way."